PULUZ PU369 is made of carbon fiber, light weight and durable. It is also portable when disassembled. The dual handles are wrapped with anti-slip rubber, you can hold it firmly without worrying about falling off. Two 1/4 inch screw interface equipped to help you connect any external devices required. 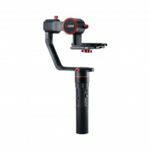 Specially designed for 3-axis handheld stabilizer like Zhiyun Crane, Zhiyun Crane M, Feiyu a1000, Feiyu a2000, and more. Enable you to shift from one hand to two hands easily when shooting. 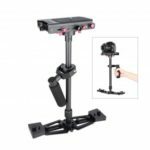 Comes with two 1/4 inch screw holes on the grip, enable you to connect the monitor, Bluetooth remote controller or any other accessories of your camera. 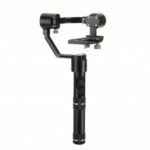 Made of carbon fiber metal, lightweight and durable. 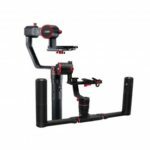 The dual grip handheld extended bracket is detachable, easy to assemble and disassemble, convenient and portable to carry. 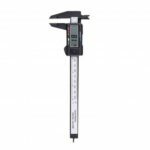 The dual handles are consisted by non-slip plastic material with patterns to increase friction. You can hold it tightly without worrying about falling off due to enduring application.